The Philippines is the third most at risk to disasters in the world, along with being vulnerable to the effects of climate change. Disaster Risk Reduction as well as Climate Change Adaptation (DRR-CCA) need to be approached together in order to face the risks of today and prepare for the future impacts of climate change. Scientists and experts from Klima served as resource persons in conducting trainings on DRR-CCA in partnership with the Ateneo School of Government and several local government units, civil society organizations and communities to create a toolkit on Mainstreaming DRR-CCA into local development processes. 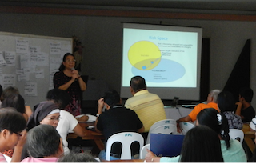 Klima researchers also conducted training sessions for our partners in building resilient communities to disaster and climate risks..